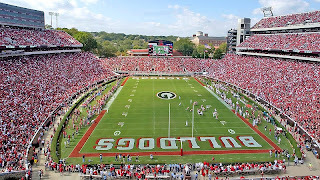 Georgia Sports Blog: UGA Fan Submits for "A Season in the Stands"
UGA Fan Submits for "A Season in the Stands"
Recently, we helped ESPN put the word out for a student to step up and represent UGA in their "A Season in the Stands" program. Here's the first submission from Danny Hunt. I am personal friends with all of them. This does not surprise a bit. Things like that happen all the time, even when cameras aren't around! Man, that's just pure genius. I miss college, but I'm glad there are people to fill my suspenders since I've gone. I was a red-shirt senior a couple of seasons ago. Way to represent. Where do you get those gray pants with the red and black pin stripe. I've been looking for those for years. Anywhere to buy them? He had those made at some fancy man's store in Athens. He picked out some silly polyester pants, got the ribbon and they sewed them on. He wears them all the time. But trust me, they are not Walmart brand. He (or shall I say his dad) paid around $190 for them. He is a die hard fan, as is my husband, but that did not go over really well with dad. Danny said he got them at Friedman's in Athens, he thinks. I was going to say that we shouldn't let Tech guys do videos with our logo in it. I thought it was too geeky to be what we want as national publicity. I understand what you are saying, but I think the deadpan spoof works in this case. Don't let these Douchebags get on ESPN to represent UGA. Whether or not it's all in jest won't matter with the rest of the nation, they make UGA look like Fla. Please tell me there are better entries than this. Well, there was only 60 secs to do a promo, and it said get their attention. The person that gets chosen will be given a video camera to chronical their football experience. Anybody and everybody has the opportunity to do just as good or better. I think it was quite funny and at least it wasn't the usual rap grap that you always see. It just didn't work for me. If you're going to do deadpan, you'd better bring your A-game. I was in a TELE class with the lead kid... Biggest douche/tool I've ever met. After 3 tests in the same building at the same time, he asked me where the fourth test was and when... Afterwards he peeled out in his Lexus sedan... Serious douche.